Here’s a statistic so shocking it looks like a typo. 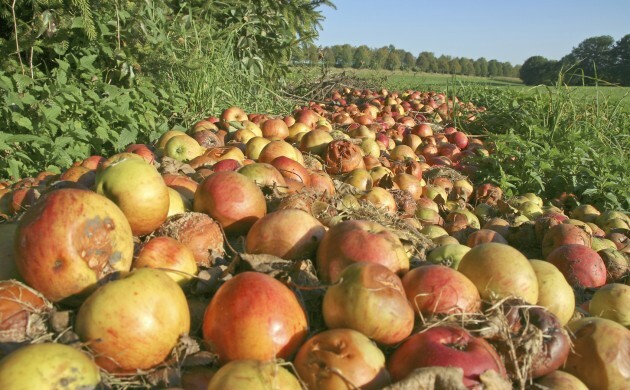 About 3.7 trillion apples are binned each year. Someone’s muddled millions with trillions, surely? Sadly not. Almost half of all fruit and vegetables produced each year is thrown away, according to the Food and Agriculture Organization. Food waste occurs throughout the long journey from farm to fork – not least when greedy shoppers buy more than they can ever possibly eat. But the bulk of food waste occurs after harvesting and before distribution – in other words, at the point in the food supply chain that few of us ever see. To understand why so much food is wasted before it reaches your basket, just visit your local supermarket. Take a bag of oranges. Try to remember what you were doing four months ago. Because that’s when they were harvested. Sure, the oranges look fresh – but they were picked in mid-April, long before they were ripe. The fruit’s not rotten, but the story certainly is. While you enjoyed the summer, the oranges were stored in a near-freezing, gas-filled warehouse. While you lay on the beach, they were sold through a series of middlemen: processors, aggregators, wholesalers, bulk breakers, distributors and retailers. While you topped up your tan, the oranges got a cosmetic treatment of their own: chemicals to improve their appearance, fungicide to prevent rotting. And when your local supermarket chain put in a bulk order, they were ripened at the flick of a switch, using ethylene gas. Far from being farm fresh, then, those oranges are months old and laden with chemicals. And all that food waste? A consequence of market inefficiency and miscalculated demand. No wonder some reckon our industrial model of supplying food is broken. But alternative approaches abound. BrightFarms in the United States builds large-scale local farms for supermarkets – drastically cutting time, distance and costs in the food supply chain. Likewise, Fresh.Land is an online platform that allows farmers to sell directly to retailers, cutting out all the middlemen. Launched in Copenhagen last year, Fresh.Land aims to get fruit and vegetables from the farm to your fork in just five days. It’s known as a ‘just-in-time’ model. Instead of languishing in warehouses, ripened at the last minute whenever an order arrives, fruit and vegetables sold through Fresh.Land stay on the farm. The trees and fields become natural ‘warehouses’. The consequences of this model go beyond freshness and flavour. First, it reduces the carbon emissions from storage by 88 percent. Second, it reduces the need for chemicals. Third, it guarantees farmers a better price. Finally, it helps to eliminate food waste. Then there’s Space10 – a “future-living lab and exhibition space” in Kødbyen. It’s exploring whether indoor gardens can grow the kind of leafy greens you find garnishing a plate of IKEA’s iconic meatballs. Who knows – one day we might see the Swedish retail giant growing greens for its in-store restaurants. But it shouldn’t only be food for thought. The next time you shop, do it with a fresh pair of eyes – and consider whether you really know what you’re buying. Originally from London, freelance journalist James Clasper (jamesclasper.com, @jamesclasper) shoots video stories for the likes of AJ+ and AP, and has had his writing published by the Financial Times, Modern Farmer, Munchies, and Treehugger. He is also the co-producer of The Snak – a forthcoming podcast about Scandinavia.